Mind if I use this character in my Sinestro Corps Recruits fan fic series? ^ no way. I was gonna make one just like that. But I ran out of yellow Paint! No worries, snag some more and make him. Just because I did it doesn't mean nobody else can. "Cast out of his clan for refusing to assassinate innocents, Shou-Jen was chosen by the "Ancient Jade Ring" the elders had locked away for centuries. The willpower to defy his elders that was once seen as weakness now grants him the power to create energy based weapons of his trade. Shou-Jen soon finds that the Power Ring brings him to Oa and a new destiny that awaits him." Shou-Jen was made from any basic Green Lantern (or DCU) body, ML Hand Ninja modded head/tunic, Superman hands so he could hold things, and wrapped wrists/shins. His staff came from a Tron 2.0 figure, clear swords from some generic ninja toy and painted clear green. "Wrathael was chosen to become a Red Lantern for displaying the most rage out of his entire species, the Dolurian Marrowers. For centuries his kind was brutally hunted for their pelts and teeth by poachers around the galaxy. Wrathael now preys on those who once hunted him after receiving his red Power Ring, crushing his victim's bones to devour their marrow with his worm-like tongue." Wrathael was made from the body of DCU Skallox, feet from Medphyll, mouth from a Generator Rex critter, mane from a SOTA Toys Werewolf, claws from a Ben 10 ghost-thing, worm tongue from an old toybiz Venom Phage figure, and swirly blood from an NECA Rhaziel accessory. Whew! He's angry, furry, and full of teeth. Oh, and the tail from a TMNT mutant future Donatello! Do you ever make any figures out of DCD figures instead of DCUC? I really, really, really try not to. The whole statue-esq approach the company takes bugs the crap out of me. T-style hips, no wrist swivels, it's like I'm holding a bigger version of the 80's toybiz figures. While I like their artist-specific sculpts and paint work, the articulation (and breakable clear acrylic joint pins/ball joints) kill it for me. Jin M'man!! Great seeing your Lantern customs, they totally Rock!! DUDE These are so Cool! Your work is awesome, Jin! Any plans for the other colors of the spectrum? I just wanna play a game. One that you've never played before. I'll be doing some other Lantern colors, yep. Gonna wait till the movie is about to hit tho. And no, unfortunately I don't take commissions. Each week I put up a few customs on Ebay, that's all I really have time for. Sorry! its a bit off topic but I would love to see your take on a Heroic Age Iron Man, Iron Patriot or that new War Machine (aka Iron Man 2.0) using one of the Hot Toys figures. wonder what would you come up with if you decided to do some Indigos! or Star Sapphires! -screams like a fan girl-OMG. I Love them all. Mermaid Green Lantern? Yes, Mermaid Green Lantern. Introducing Lunessa Koinua swimming your way from the watery planet of Aeros. Fitting because she was made from the body of the Naut Kei Loi Movie Masters, fins swapped and turned upside down with some modifications to the body. The upper female half is made from a Katma Tui with a custom Zatanna cast head from Camco Kid castings which you can find in my Links page. A trident construct was created for her and Lunessa was ready to swim with the intergalactic fishes, see! Somebody wrote in to me, "Hey, why didn't Hal have white gloves in the movie? You need to do that!" And here we are! I tweaked Hal's suit for the eventual Green Lantern 2 movie, adding white and black detail including the grey on the sides of his hairline like in the comics. His range of articulation needed to be modded too so I carved out plastic from the back of the knees, front of his biceps, and back of the head/neck so he could fly looking forward. One flight stand and energy effects later and this fan suggestion was completed, Hal ready to take flight as his distinguished, post-parallax self. [quote=Jin Saotome;568307]"Cast out of his clan for refusing to assassinate innocents, Shou-Jen was chosen by the "Ancient Jade Ring" the elders had locked away for centuries. The willpower to defy his elders that was once seen as weakness now grants him the power to create energy based weapons of his trade. Shou-Jen soon finds that the Power Ring brings him to Oa and a new destiny that awaits him." I love this one!! Awesome work!! Jin! because of your website did i have the confidence and knowledge to customize my own figures! 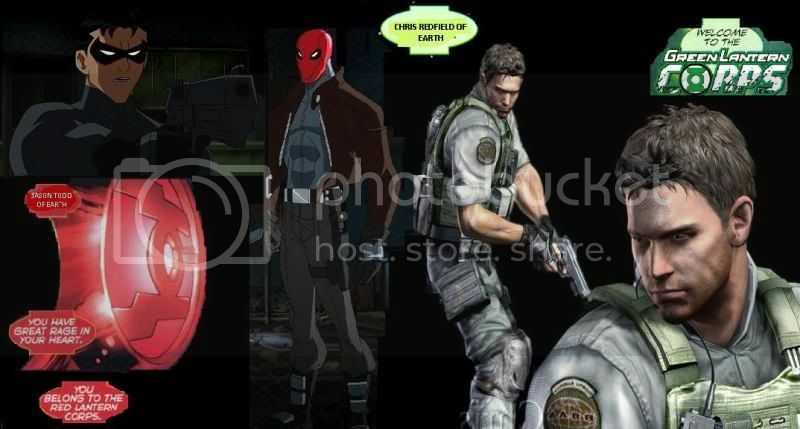 Ive been a big fan of your work and most notable was your chris redfield customs!!! Hey Jin, would you be willing to make some chest logos for me I will pay for them I need some black and white lantern logos I also have a redesigned green lantern symbol I would like printed pm me if interested. Jin did you stop making customs or just stop posting here?